Grandes Ecoles means Great Schools/Universities (for higher education)! There are 80+ Universities, more than 200+ Engineering and Commerce schools. Master's degree is usually for two years. Cost of Education is low as compared to UK, US. In public universities tuition fees might range from EUR 150 - Euro 800 depending on the level of education (like BS or Licence, Masters, and Doctorate). Courses like Engineering might have slightly higher fees. Private institutions might have higher fees. Most of France's business schools are private, Yearly tuition varies and is generally between EUR 2,000 and Euro 35,000. Higher education systems covers Undergrad+ degrees (Masters/Postgraduate and above). Under Open University system every student with a BS degree have right to do higher education without any selection procedure. Under the selective system, students might get admission via an examination or interview or both. France's universities and educational institutions do not distinguish between international students and French students, admission criteria and tuition fees are same for international and local students. More than 40% students doing PhD are international students. For your study abroad experience, France deserves your strong consideration. With its rich the combination of educational institutions, arts and culture, and national history, there may no better place in the world to be a student. Every year, over a quarter of a million international students attend university in France, making France the fourth most popular study abroad destination in the world after the U.S., U.K., and Australia. France’s highly ranked universities and comparatively low tuition make it an attractive option for students interested in a cross-cultural undergraduate or graduate experience. And it is a beautiful place to live! In a recent survey, 64% of international students surveyed named France as the most beautiful country in which to study, second only to Canada. The French university system enjoys a strong tradition of excellence in academics and the arts. France has 250 elite institutions called grandes �coles (similar to American Ivy League schools), 83 public universities, and many other research institutes and specialized graduate schools. A total of 39 universities in France are ranked on the QS World University Rankings, with 11 of those schools placing well in the Top 300 Universities worldwide, and two world-renowned universities - Ecole Normale Superiore Paris and Ecole Polytechnique - placing solidly in the Top 100. Across the country, there are over 36,000 different courses and degree programs available at the undergraduate and graduate levels. 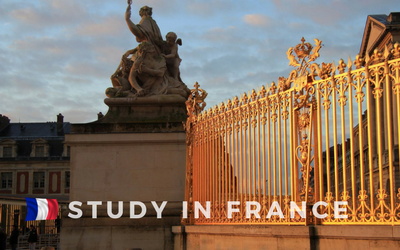 While you can study abroad in France and concentrate on nearly any subject, the most popular degree programs for students studying abroad in France include the fine arts, architecture, and history. At many universities, international students will find that the majority of their classes are taught in English. At French grandes �coles, admissions are determined by highly competitive entrance exams. About 30,000 international students attend these elite universities. International students can attend university in France for either their undergraduate or graduate programs, sometimes choosing to stay in the country to complete their entire education. Students attending French university from the U.S. may be pleased to learn that bachelor programs are typically completed in three years, rather than the four years more commonly expected back in the States. Additionally, graduate students may wish to consider pursuing their PhD in France where their program can be completed in about three years. Licence (equivalent to a Bachelor’s degree) �" three years, 180 credits. Master’s (one of two tracts) �" two years, 120 credits. National doctoral degrees (PhD) �" three years, 180 credits. Depending on your nationality, desired degree program, and any previous college-level coursework completed, in order to study in France, you must follow the specific application procedure mandated by the French Ministry of Higher Education for individuals in your situation. For American students applying for undergraduate studies in France, the application process begins with creating an account with the French Ministry’s website and submitting a Preliminary Request for Admission (DAP). While this might feel like jumping through extra hoops, it is actually an efficient system for streamlining the university and visa application processes. Ideally, students should submit their DAP in November prior to the year they intend to first enroll in school. Foreign students attending university in France may be surprised to learn that tuition rates are equal between French nationals and students coming into the country from foreign countries. In most cases, tuition averages below $1,000US! In fact, it is possible to have the experience of a lifetime studying abroad for four years, and graduate college debt-free. There are many grants and scholarships available to international students, from licence up to post-doctorate levels. The French Ministry of Foreign and European Affairs offers grants to international students. The Erasmus Mundus programme is open to non-Europeans, with grants for Master’s, Doctoral and special partnership projects. And U.S. students may also consider applying for financial assistance through the U.S. State Department’s Fullbright Scholar program. Along with the costs of tuition in France, you also need to budget for all living expenses - some more obvious than others. These costs include accommodations, food, books and supplies, transportation (local and international), and miscellaneous fees. Depending on where you will be studying in France, students coming from the U.S., can expect these costs to be commensurate with what is normal back home. The exception to this, of course, is Paris - one of the most expensive cities in the world for cost-of-living. Given the low tuition costs for students in France, many students from affluent countries are able to pay their education-related costs out-of-pocket. Even still, applying for scholarships to help with tuition and books, is always an option for U.S. students heading abroad. However, many scholarships do not allow the award money to be put towards cost-of-living expenses. So, U.S. students will need to have a multi-faceted plan for covering all the costs of studying and living abroad. Fortunately, most of the grandes �coles programs are eligible for financial aid. If you intend to cover these expenses with student loans, you will need to complete the FAFSA in order to apply for financial assistance. International students studying in France are also eligible to work up to 20 hours per week while they are living in the country on a student visa. This is a great way to work a small job to help cover monthly expenses, or perhaps even arrange a job that provides you with valuable professional experience that relates to your course of study. Or, if you enjoy working with children, consider applying for the Teaching Assistance Program in France (TAPIF). Native-english speaking students working for this program spend twelve hours per week teaching English in local elementary, middle, and high schools. They receive about 800 Euros per month - plenty to cover living expenses while in school. Before you begin your studies in France, it is important to have an idea of your long-term educational and professional goals. If you are planning on completing a bachelor’s degree in France and continue your education in the States, a little research is required first. Be sure that there are good graduate degree programs that will accept your foreign diploma. Some programs may require that you repeat classes or take additional placement tests to ensure you have met the eligibility and prerequisite requirements for acceptance and matriculation. Often, foreign students find it easier to complete both their undergraduate and graduate studies in the same country before moving back home to start their professional career.